If you're used to the standard north Indian dishes that are ubiquitous in Indian restaurants (think butter chicken), you're sure to get a surprise in Kerala. The coastal state's distinctive cuisine is tied to its ancient trading heritage and is a fusion of global Christian, Muslim and Hindu culinary traditions. Coconut, seafood and spices feature heavily, and combine together to give Kerala's food its own flavor. There are differences between dishes in north and south Kerala too — those from the northern Malabar region are characterized by richer spices and have Arab, Dutch and Portuguese influences. Don't be shocked to find beef on the menu either! It has become an intrinsic part of the state's identity since Syrian Christian missionaries arrived there with their recipes centuries ago. Read on to discover the top dishes you need to try in Kerala. 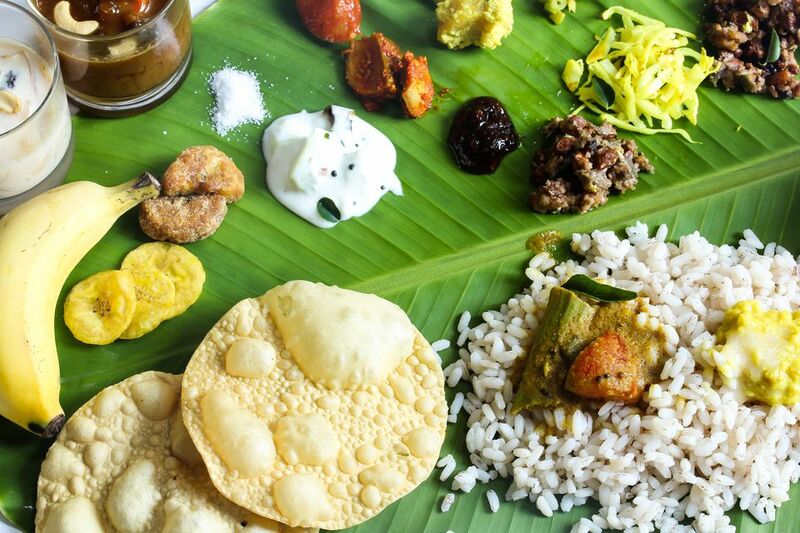 For a quintessential introduction to Kerala cuisine, start with sadhya (Kerala-style set banquet) on a banana leaf. This vegetarian Hindu feast has more than 20 items, and is an important part of festivals such as Onam. The items are placed on the leaf in a particular order from left to right. Pickles, chutneys, salt, pappadam, and plantain chips are on the left. Curries are on the right. Rice, sambar, rasam, payasam, and curd are also served at different times. Sadhya is usually a lunchtime meal and is best eaten with your fingers (really, please don't use cutlery!). Here's a helpful guide on how to eat with your hands in India. Ideally proceed from left to right, for a progression of flavors from mild to pungent and sweet. When you've completed the meal, fold the banana leaf in half to indicate you've finished. That's if you can devour everything! In capital city Trivandrum, order the extensive sadhya at Mother's Veg Plaza. Better still, get yourself an invitation to a wedding or special occasion at someone's home. The name of this legendary Syrian Christian dish sure isn't easy to pronounce, so it's fortunate that it's known as beef dry fry everywhere (you can colloquially just ask for BDF). The dish is so loved in Kerala that many people refer to it as the state dish! To make it, chunks of beef are very slowly stir fried or roasted in a heavy pan along with coconut pieces, aromatic ground spices, chilies and curry leaves. Some tourists prefer Syrian Christian beef curry, as it's more like Indian food to them. However, the locals are prone to disagree. Beef fry is popularly consumed with alcohol in local bars and toddy shops. So, you'll find the most delectable dishes there. Award-winning Mullapanthal toddy shop on MLA Road in Tripunithura, near Kochi, is among the best. Don't like spicy food? This light coconut fish stew, which is a signature dish of central Kerala, is ideal. Trade with Portugal flourished in central Kerala and the dish is thought to be a variation of a Portuguese one-pot fish stew called caldeirada. Its name, molee, may be a derivative of the Spanish word mole, meaning a cooking sauce or mixture. The stew is made without the tart tamarind (kudam puli) that's common in other Kerala curries. Cardamom pods, cinnamon sticks, cloves, peppercorns and curry leaves provide the subtle flavors. ﻿Meen molee is widely available in Kerala. It's a specialty at famous Fusion Bay restaurant, on KB Jacob Road in Fort Kochi. Gobble it up with appam or rice. Oceanos at the Elphinstone Residence in Kochi is recommended for seafood, including meen molee, as well. A hot and fiery Kerala fish curry, meen vevichathu is likely to make you break out into a sweat! This red, tangy, tamarind-based curry is associated with the state's central Kottayam district. It's traditionally made without coconut by boiling the fish in a clay pot with selected spices, especially plenty of Kashmiri chili powder. Sardines or mackerel further boost the flavor. Try meen vevichathu at the ambient Fort House Restaurant, in the garden of the Fort House Hotel in Fort Kochi. It's served in traditional style with kappa (cassava plant root) as the accompaniment. You may not expect kappa (tapioca/cassava plant root) to be widely consumed in Kerala. The story of how it happened is interesting. Cassava is said to have been introduced by the Portuguese. However, King Visakham Thirunal of Travencore ordered its cultivation during his reign in the 19th century to ward off recurrent famine. Residents were reluctant to embrace it, as it was viewed as poor man's food. However, that changed in the 1940s when a huge famine hit the state. Now, kappa is considered to be a delicacy. It's made by boiling and mashing the cassava plant root with grated coconut and spices. It's commonly eaten alongside fish curry. You can't visit Kerala and not sample the state's official fish, karimeen (pearl spot). This revered fish, native to the backwaters of the Kuttanad district around Alleppey, is synonymous with karimeen pollichathu. The fish is marinated in a spicy paste, wrapped in a banana leaf and steamed. Yum! For authentic karimeen pollichathu head to the elegant Grand Pavilion restaurant at the Grand Hotel in Kochi, or family-run Karimpumkala Restaurant in Pallom near Kottayam. Karimpumkala started as a toddy shop in 1958 before expanding. Dishes are made from recipes belonging to the owner's mother. Kerala has its own style of biryani. In fact, there are a couple of different ones. Thalassery biriyani, from Thalassery in the Malabar region, is the most celebrated. Traders from the Middle East brought it with them. They settled there and established themselves as the Muslim Mappila (Moplah) community. Their biryani is heavy on spices and is made from short-grain jeerakasala rice, as opposed to the usual long-grain biryani rice. Paragon Restaurant, founded in 1939 in Calicut (Kozhikode), is the place to stuff yourself full of Malabar biriyani. Paragon's off-shoot, Salkara, is also renowned for biryani. As too, is iconic Zain's hotel on Convent Cross Road near the beach in Calicut. If you'd rather dine somewhere more upmarket in Calicut, head to Mezban Restaurant at Hotel Asma Tower. Prefer chicken to fish but still want some fire in your mouth? Nadan food certainly packs a punch! This home-style cuisine is among the spiciest in Kerala. It tends to be quite oily too, and has many variations. In this dish, the kozhi (chicken) is marinated in chili powder, and red and green chilies are used to flavor the thick curry sauce. So, proceed at your own risk! Nadan kozhi curry goes well with rice, appam or Malabar parotta. Enjoy it pier-side at Seagull Restaurant, on Calvathy Road overlooking the sea in Fort Kochi. Make sure you book ahead if you want a table with a sunset view. Appam is likened to a Dutch pancake but it's made with a batter of fermented rice and coconut milk. This side dish is eaten as a bread with all kinds of stews and curries. Soft in the middle and crispy on the edges, it's a staple in Syrian Christian households where it's served up at all times of the day, including breakfast. When eating, break off a small piece of the appam with your right hand and use it to pick up some of the main dish. This succulent south Indian bread is, as its name suggests, from the Malabar region of Kerala where it came via the Arabs. Its flaky, layered appearance makes it easily to distinguish from the conventional north Indian paratha. Tear it apart with your fingers and eat it with beef for the ultimate satisfaction. For Kerala residents, this combination isn't a dish but an emotion. Malabar parotta can be paired with any kind of curry though. Another Malabar specialty, pathiri is basically a roti or pancake made of rice flour. It belongs to the Mappila Muslim community, who commonly eat it at dinnertime with a non-vegetarian curry. The pathiri can be cooked on a griddle (ari pathiri), deep fried (ney pathiri), or stuffed with meat and vegetables (erachi pathiri). Want to have a typical Keralan breakfast? Puttu with kadala (chickpea curry) is one of the most popular meals in the state. Locals even eat puttu with fish curry for breakfast, although this might be a bit too much for western palates early in the morning! The puttu is made by steaming ground rice and grated coconut together in cylinders. In testament to the popularity of puttu, Dhe Puttu in Kochi and Calicut is totally devoted to the dish. This restaurant chain was set up by Keralan actor Dileep and television personality Nadirshah to showcase puttu. About 20 varieties are available there, and not just for breakfast. Some of them are really creative and curious, with meat and fruit mixed in! Go there at lunchtime for the puttu thali (platter). The king of desserts in Kerala, payasam is similar to kheer from other parts of India. It consists of rice that has been slowly cooked in milk, coconut, sugar, cashews and dry fruits. This dessert is always served during festivals. Pradhaman is a thicker, Kerala-style version of it. Different ingredients such as jackfruit, lentils, chick peas or mung beans are sometimes used. Don't pass up the opportunity to savor this sweet Kerala treat, which is a yummy snack. Ela means leaf, and the parcels are made with ada (rice) flour dough filled with a mix of coconut and jaggery (unrefined cane sugar), and steamed in a banana leaf. The banana leaf gives it a delightful smell and flavor. Bet you can't stop at only one piece!